We’re reaching the halfway point of the Winter term – here’s a look ahead at the term dates for the Spring and Summer. If you’re coming to Hand in Hand you must commit to the Late Spring and Summer Term and to a dress rehearsal on August 13th. An allowance will be made if you need to miss an occasional session, but you must at least 9 of the 13 session in the two terms, as well as the dress rehearsal. The full timetable is viewable as a spreadsheet. Full dates – click to enlarge! Details and performance dates – click to enlarge! Hand in Hand: Choir members, please register now! 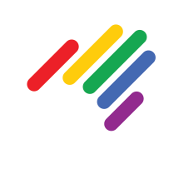 We’re delighted to be one of more than 25 choirs from all over the British Isles who’ll be taking part in the 2019 Hand in Hand LGBT Choirs Festival. The festival spans Fri 16th, Sat 17th and Sun 18th August and promises to be our biggest performance yet. Planning for the Hand in Hand Festival is well underway. If you want to come and sing with Spectrum – and we hope you do! – the time to register is now! You’ll need to confirm your attendance with us, and also register on Hand In Hand’s system and pay a £40 registration fee. We know that for some members, the event will be expensive and we hope to be able to offer limited bursary support. Please donate to our bursary fund if you can. Unless you’ve applied for bursary support, please register with us and Hand In Hand by Tues 5th February. How the year has flown by! It’s hard to believe it, but it’s nearly the start of the Winter term! Term starts on January 8th and, as usual, we meet at 7.30pm in Exeter Community Centre. The term is six weeks long and will cost £33. If money would be a problem – for example, because you’re on a low income, a student, or receiving benefits – we’re happy to offer a lower rate and the option to pay in weekly instalments. Please contact any member of the committee. What’s the difference between “Drop-in” and “Committed”? We ask that everybody commits to attending the full term, with the exception of the first two weeks. You can attend any of the drop-in sessions you like, without committing to the full term. These cost £5.50 each. If you attend from January 22nd onwards (and we hope you do!) you’ll need to pay for the full term at the cost of £33. If you’ve paid separately for the drop-in sessions, the price will be reduced to take into account you’ve already paid. If you’re interested in joining the choir, or would just like to see what we’re all about, we’d love to meet you. Our choir is for everybody in the LGBT+ community and friends. Our current members range in experience from people who’ve only ever sung in the shower, to seasoned singers with many years’ experience. 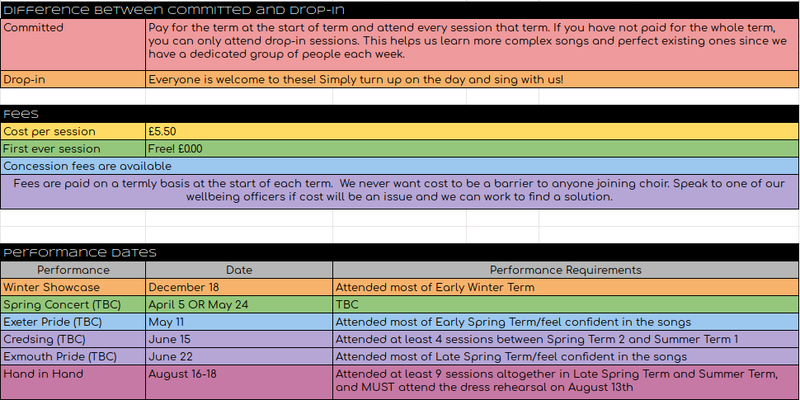 We recommend you come along at the start of term for the drop in sessions if you can, as this is when we’re at the start of learning new songs. During committed term time, we’ll be focussing hard on specific pieces and it might be difficult to catch up. We’re a very friendly bunch and your first session is free, so you needn’t worry about the money. Huge thanks to everybody who voted in the election. Huge thanks to those who joined us for our first session of the new term last Tuesday. We hope you enjoyed singing again after a long summer’s break. You can pay by bringing cash or a cheque with you (payable to Spectrum Choir), or by making a bank transfer (please use your name as a reference and let us know to expect your payment!). We don’t want anybody to feel they can’t afford to attend choir. If the fees are beyond your means – for example, if you are on benefits or unemployed – you’re welcome to pay an amount which would suit you better. It is possible to pay in instalments as well. Just ask a member of the committee. Due to our upcoming performance in London, we have changed our timetable slightly to add more rehearsal times. We will have 3 sessions (May 29, June 5, and June 12) that are only for those who are performing with The Pink Singers in London. We hate to have to leave anyone out, but we need to do this in order to be extremely polished for one of our biggest performances to date. Everyone is still very welcome to our two drop-ins on May 15 and 22, and to join us for another committed term June 19-July 17, before we take a break for summer! 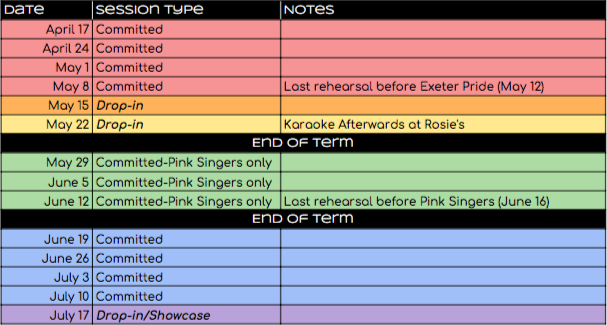 If you are performing with the Pink Singers in London, attendance to both drop-ins and the 3 session mini-term is mandatory. If there is a reason you cannot attend any of these, please get in touch with Emily as soon as possible. The full timetable and term costs are available to download here. We never want cost to be a barrier for anyone joining the choir, so if this is an issue, please get in touch. Please also join us at Rosies after the session on May 22nd to celebrate another successful Spectrum term! Subscribe to our Google Calendar. 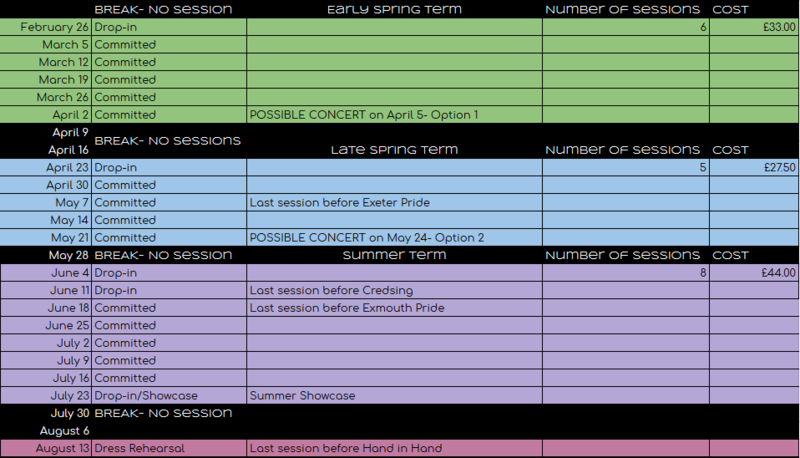 Here’s our timetable for April 17 all the way to July 17, and some info on our pricing. Please pop us a message if you’ve got any questions. Also keep in mind that we never want finances to be a barrier for anyone joining the choir, so if that’s a concern please do get in touch!